Home » Deals » BDS Best Survival and Prepping Deals of the Week – Be Prepared. Never Miss a Deal. You don’t always have to pay and arm and a leg for survival gear but sometimes finding the time to find all the best deals is hard. At Backdoor Survival we have decided to help out by finding useful deals to fit a variety of budgets and prepping goals. This page was created to track the top deals, as they happen. It’s meant to be your own stop “discount sanity check”. Always be prepared. Never miss out on the best deals in prepping and survival! Remember to check back weekly for great finds! You never know what we might find to help you lead a more prepared life! This full list covers all the deals we are tracking, irrespective of the various categories. Everyone needs a good compression stuff sack or two. There are a lot of items that can get far too bulky if you want to utilize your pack most efficiently. This olive green compression sack has a zippered top for stashing small items. The bottom handle features D-rings so you can attach the stuff sack to any other bags with ease. With an 11 inch diameter and a length of 23 inches you should have no problem using this for a sleeping bag and some clothing in a bug out bag. This same bag is also available in an XL size for those with thicker sleeping bags. My husband pointed out this sleeping bag to me for this list. He makes sure to show many any good deals on gear for this weekly list. 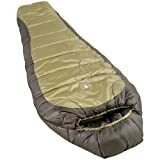 This is the best bargain on a heavy duty sleeping bag I have seen. The bag is completely made of polyester material and fill yet only weighs 3.75 lbs! For a bag that fits people up to 6’2 height and is rated to be comfortable down to 0 degrees F is pretty amazing. This deal seems like it won’t last long. I would team this up with the compression sack above and for about $50 you have a pretty good set up for camping and survival under cold conditions. I like that this mummy style bag also has a zippered bottom for ventilation when it is warmer. I love tools. I never truly appreciated what they could do until Matt and I moved to our piece of overgrown property and started getting it back into shape and then the adventure of building our house came along and I learned a lot of lessons about tools. This kit gives you a lot of the basics that I think any homeowner or DIY type should have on hand. Stanley is a decent brand. We have used a lot of their tools and they seem to hold up well while not being overpriced like Dewalt. This kit includes about any screwdriver or allen head you will need. No frustrating moments of not having the right bit. Oh and you get a crescent wrench which is something that is so handy I keep one in one in the kitchen. GPS and the internet are nice but there is nothing like the security of a good old fashioned Rand McNally Road Atlas. This up to date version is a must have for those that travel a lot or plan on bugging out with transportation. It is kind of big to carry if you were on foot but having a set of maps to go by during SHTF or if you are traveling and there is an incident and you need to get home via an alternative route, is an invaluable thing. Physical maps are too underrated and Rand McNally has always been the trusted source for Atlases. It is worth stashing one of these in each vehicle for sure. One thing that is always noticeable and not always an enduring quality of mylar blankets is the bright shiny aluminum foil aspect. If you want to be seen and rescued this is a positive thing. If you are trying to hunker down and not be notice for awhile and get out of the situation on your own terms, that shininess could be your undoing. 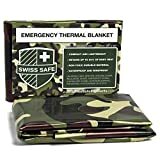 I know these are more than 3x the price of a standard mylar blanket but having the option of concealment and warmth at the same time during a major incident might just be worth it. There is also a gray and white camo version available which might be nice in urban environments or snowy conditions for concealment. This little ultra light stove folds down and fits in the palm of your hand. Use with 8 oz propane canister the manufacturer says it will last for all cooking activities for 2 days. Time to boil a liter of water is a mere 3 minutes. Right now Amazon has a coupon for $3 off the super low price which means you pay $9. 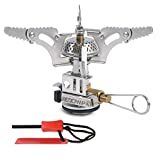 At this price these camp stoves would make a good prepper survival stocking stuffer! Compasses are important tools that everyone should probably have. 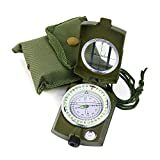 This is a nice compass that is worthy of your kit but also excellent for teaching kids and adults alike how to orienteering. I like that it comes with a bag and belt loop so you can strap it on and go with the assurance of having easy access instead of having to dig in a bag or wear it on your neck all the time. Powdered eggs are nice to have for SHTF baking. I have heard mixed reviews by some for powdered eggs that are reconstituted and eaten on their own. For baking they are probably worth it to have on hand though. I did the math and when you buy this can you are putting back the equivalent of about 6 dozen eggs. To put this in perspective you are paying $4.66 per dozen eggs with a minimum $10 year shelf life. I think it is worth the extra money to not sacrifice the quality of baked goods during an emergency. They are also a good source of protein. Food is important for fuel and morale during a survival situation. The little extras that make it seem more like what you are used to are important. 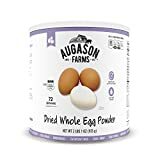 If you want to buy a lot of dried eggs you can get the price down to $3.21 a dozen by purchasing the 18 lb bucket that is sealed and a rated shelf life of 10 years. Wise Food Storage Deals: You can currently save up to 50% off Wise Food Storage packages here. Most deals are at least 30% off, with many in the 40-50% off range. Valley Food Storage Promo Code: The folks at Valley Food Storage have generously offer BDS readers 10% off the entire cart with code “BDS” at checkout. This is in addition to the current 40% off deals they are offering on combo food kits. Remember to check back next week for more great deals on gear from the Team at Backdoor Survival! re: the outon camp stove–you imply in the text that it’s a rocket stove; it isn’t. it’s just a stove designed to accept most combustible materials. For folks buying a Zippo – remember that it comes empty and the fuel you put into the lighter evaporates over time…so not the best choice for a BOB, but a good tool for post event where you’ll be using it often. I have a bunch of them and a bunch of fuel, but I only tried them each once to make sure they were ok, so I didn’t waste a bunch of fuel. There is a great article here that goes into more depth on the Zippo brand lighters and what fuels work. Just give it a quick search and I’m sure it’ll come up. That’s why I replaced my Zippo insert with a Thunderbird butane insert. Never evaporates, never burns your leg. They come on two versions, jet flame blue and traditional yellow flame.